Fourteen-year-old Emmy Reeves has always had a passion for art. From her animal drawings, to her realistic sketches of animals, to the murals on her bedroom wall, Emmy’s talent is very apparent and far-reaching. But her latest piece of work goes even deeper. Called "Gaia's Aegis," Emmy’s sculpture represents Gaia's- or the Goddess of the Earth’s- influence and protection throughout her life and for those who have become a part of it. Gaia is depicted as a tree, with animals resting at her roots, representing each person who has touched Emmy’s life along her journey. Gaia is the protector, shield, and guide. The cardinals in Gaia’s branched are Emmy’s friends who have passed away and never made it home, and her great-grandparents. “My inspiration for the piece came from my faith in the mother earth and the experiences I had while awaiting a pancreas transplant last year,” said Emmy. On February 10, 2018, Emmy became the youngest person in the United States to undergo a pediatric pancreas transplant of its kind in nearly 25 years at University of Minnesota Masonic Children’s Hospital. Now, a year later, she and her hospital care team celebrate a year after transplant, and what that milestone means. Emmy was diagnosed with type 1 diabetes when she was 4 years old. Type 1 diabetes is a disease where the immune system destroys the beta cells of the islets that make insulin, therefore kids with the disease typically need insulin injections. But Emmy, it was discovered, was essentially allergic to the very thing that was supposed to keep her alive. She was given a strict regime of painkillers and antihistamines to control her allergic reactions. But as her complications grew worse, her parents turned to a different solution- a pancreas transplant. A new and healthy pancreas would enable her to start producing natural insulin—effectively ending Emmy’s diabetes. Dr. Kandaswamy led the multi-disciplinary team that performed Emmy's transplant. He says that Emmy stands out as someone whose case was not only initially successful, but has had sustained success and he attributes that to the strong team and legacy at the University of Minnesota Medical School. The first-ever pancreas transplant took place in December of 1966 at the University of Minnesota. Since then, more than 30,000 pancreas transplants have been performed in the United States. University of Minnesota care teams have completed more than 2,300 of those, more than any other transplant center in the world. Emmy’s successful surgery and year anniversary is another example of how the medical school continues to be leaders in the field. Life now is very different for the Reeves family. Emmy typically wakes up before they her parents, the energy of a teenager finally able to course through her veins now that she longer needs to take multiple doses of antihistamines. Emmy can also eat what she wants now. As she told KARE 11 during a recent interview she has now discovered donuts, and loves them, especially apple fritters. “She finally gets to be a kid; she gets to live,” said Tiffanie. 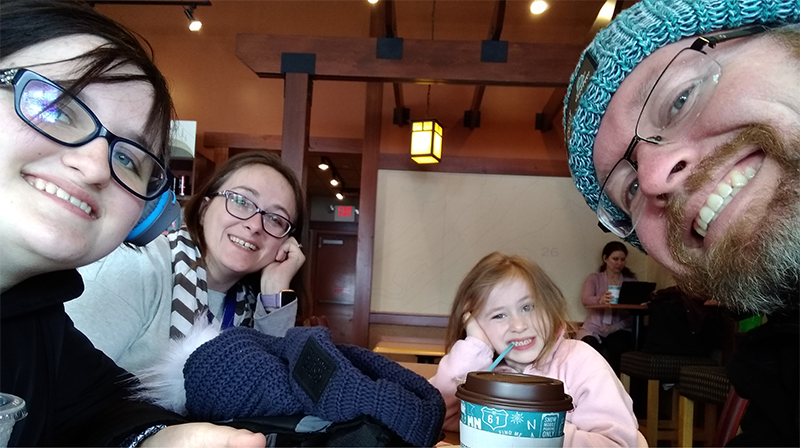 When Emmy last saw her M Health pediatric endocrinologist Melena Belin, MD, associate professor, Department of Pediatrics, University of Minnesota Medical School, she was no longer using insulin and had come off her medications. But now, Dr. Bellin has seen a change. She has seen Emmy blossom. During her visits, Emmy is often drawing or creating something, showing her medical team her artistic side. Emmy has certainly opened up since her surgery, now sharing her story as well. Drs. Kandaswamy and Bellin say while this type of surgery may not be a solution for everyone, Emmy’s journey has taught them a lot.